Bang, bang, n-Gage: you're dead. Again. Maybe for the last time. Here's a short look at your meaningless life. You were born but a hyped, sidetalking Taco. Then, after we had our laughs for several years, papa Nokia ditched your dedicated hardware and opened it up to phones of all kinds—as long as they said N-O-K-I-A on them. It was a smart move. Because you sell lots of phones, and if your gaming platform was to live, it needed to be on as many of those as possible. It looked ok at this point, as a platform and service. And the hardware was nice at times. But that didn't change the fact that no one I know ever talked about you, n-Gage, much less played with you. The button layouts, games and online vs modes never really came together as well as you'd liked in terms of people buying and using it. Why? I don't know. I guess, at least in America, we couldn't get the handsets for less than the price of 5 Nintendo DSes. 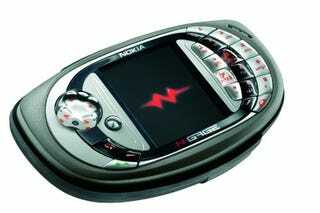 But beyond that, you never had any games that people cared about, despite having signed up companies like EA so easily because papa Nokia was still number one. And every year at E3, your booth was like a buzz-vacuum. So, I can't say we'll miss you. We hardly knew you were there. But let's just chalk this up to more high end consumer failure to excite at Nokia, which has been a trend of late. I'm done. Honestly, this much word count on nGage is charity, even as a farewell. See ya. Hope we never have to see you again. But the word is, you'll probably just fold some games of yours into a general app store. The dead never stay dead for long in the gadget game.